Spaghetti and Clams is a classic Italian dish that can be made either "red" or "white." The only difference being that the white sauce gets most of it's flavor from the clams while the red uses tomatoes which produces a much bolder flavor. Both versions are easy to make it just depends on your preference. I have no idea why, but growing up I would only eat spaghetti & clams in red sauce. It's only recently that I've started eating and really enjoying the white version. One of my favorite pots to cook spaghetti in is my Anolon Nouvelle 6.5 quart stainless stock pot. This stockpot's size is ideal for tasks that require a medium-sized pot to get the job done. With its European-inspired, tulip-shaped design, the pot is the perfect height for boiling spaghetti. I love this pot & I know you will too! Heat oil in a 12- to 14-inch heavy skillet over medium heat until it shimmers, then cook garlic and red-pepper flakes, stirring, until pale golden, 1 to 2 minutes. Add tomatoes with their juice and simmer, uncovered, stirring occasionally, until thickened, 7 to 10 minutes. Cook spaghetti in a pasta pot of boiling salted water until al dente. Meanwhile, add clams (in shells) to sauce and cook, covered, shaking skillet occasionally, until clams open wide, 6 to 10 minutes. Add spaghetti to sauce and toss to coat. First thing I would make is marinara sauce. The first thing I would make is a fresh homemade italian marinara with meatballs! Thanks so much for sharing! Fabulous giveaway for everyone! Wow, I'd love to whip up a batch of spaghetti and clams in that new pot!! You know what's funny, I grew up eating it w/ a white sauce only. I made one the other day and actually said, I really want to try it w/ a tomato base. Can't wait to try! I'll have to make this for my mom - she loves clams and pasta together! I would make crab and potatoes. I think I would make a big pot of spaghetti with meatballs for the entire family. I might even try this clam one too! Having a turkey this weekend - first thing I would make was turkey broth with the leftover turkey bones. What a gorgeous dish and a gorgeous pot! I want to say tamales since this looks to be the perfect size and I've been craving them. But I might make a big ole batch of Sunday gravy with garden fresh tomatoes. Lovely recipe but I can't take my eyes off that pot! Your spaghetti and clams looks wonderful! I'd eat a big bowlful! What a delicious meal! My husband loves clams. I'll have to give this recipe a try! Homemade clam sauce is one of my favorites! My husband always loves when I make white clam sauce but I have yet to make the red version. This must be done! LOVE clam sauce, your recipe looks divine! The first thing I would make is bone broth for freezing. What a delicious recipe. 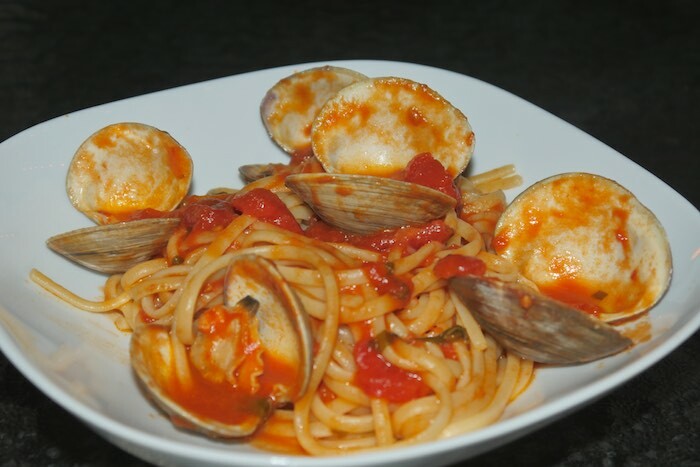 I love clams and I bet the sauce is flavorful and perfect for dinner. I think I would try your recipe. It sounds like heaven!